Former Southern coaches and current administration members are pictured following the 100 years of Racine Southern basketball celebration on Friday evening. Pictured (from left) are former coach Asa Bradbury, elementary principal Tricia McNickle, Supt. Tony Deem, Commissioner Randy Smith, event emcee Scott Wolfe, high school principal Daniel Otto, Commissioner Tim Ihle, former coach Jay Rees, athletic director and former coach Carl Wolfe, former coach Jonathan Rees and State Rep. Jay Edwards. A new 100 years of Southern basketball banner is now located beneath the score board in the Southern High School gymnasium. Southern Athletic Director, former coach and player Carl Wolfe speaks during Friday evening’s 100 years of Racine Southern basketball celebration as members of the administration, along with local and state officials look on. 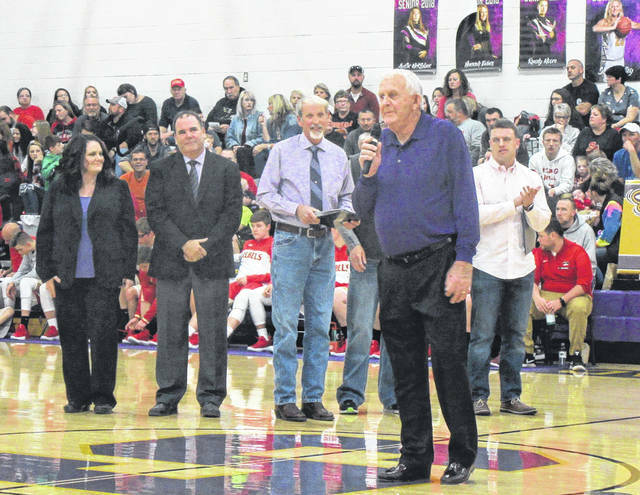 With many former coaches and players in the gymnasium, emcee Scott Wolfe introduced presenters and speakers, including athletic director Carl Wolfe, commissioners Tim Ihle and Randy Smith and State Rep. Jay Edwards. “It’s a good night to be a tornado,” said Carl Wolfe of the celebration during the home opener. Ihle, himself a former Racine Southern basketball player, told of growing up in Racine where basketball was the past time for kids. Telling a story from his playing days, Ihle recalled walking along with his brother and others to the basketball court, which was outside, with one carrying a basketball and one a broom — to clear the gravel from the court. Eventually, said Ihle, the kids would sneak into the old junior high building to shoot in the building. While they tried to be secretive, the janitor knew of boys playing basketball and simply asked that they lock up as they leave. Eventually, word spread and the boys were given a key to allow them to continue to work on basketball, Ihle told those in attendance. Commissioner Randy Smith read a proclamation which was approved during a previous meeting recognizing 100 years of Racine Southern basketball. The proclamation acknowledged the many sectional, district and league titles, as well as the three state tournament trips for the Tornadoes. Edwards also presented a certificate to the district from the State House of Representatives to recognize the accomplishment of 100 years of basketball. “It’s amazing what a round ball and hardwood court can do,” said Edwards, acknowledging the efforts of good coaches over the years and the work put in by the players. Edwards stated that no matter what this time of year there is one constant in the region on Tuesday and Friday evenings — high school basketball. Among the former coaches in attendance were Jay Rees, Jonathan Rees, Asa Bradbury, Steve Randolph and Carl Wolfe. In continuing the winning tradition established in 1918, the Tornadoes earned a win on Friday evening over visiting South Gallia. 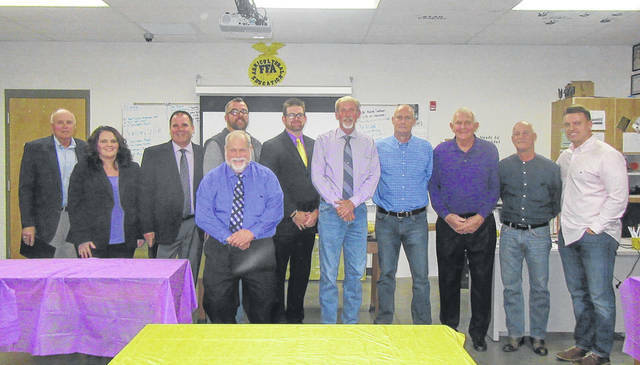 https://www.mydailysentinel.com/wp-content/uploads/sites/14/2017/12/web1_12.12-SHS-120171211183938775.jpgFormer Southern coaches and current administration members are pictured following the 100 years of Racine Southern basketball celebration on Friday evening. Pictured (from left) are former coach Asa Bradbury, elementary principal Tricia McNickle, Supt. Tony Deem, Commissioner Randy Smith, event emcee Scott Wolfe, high school principal Daniel Otto, Commissioner Tim Ihle, former coach Jay Rees, athletic director and former coach Carl Wolfe, former coach Jonathan Rees and State Rep. Jay Edwards. 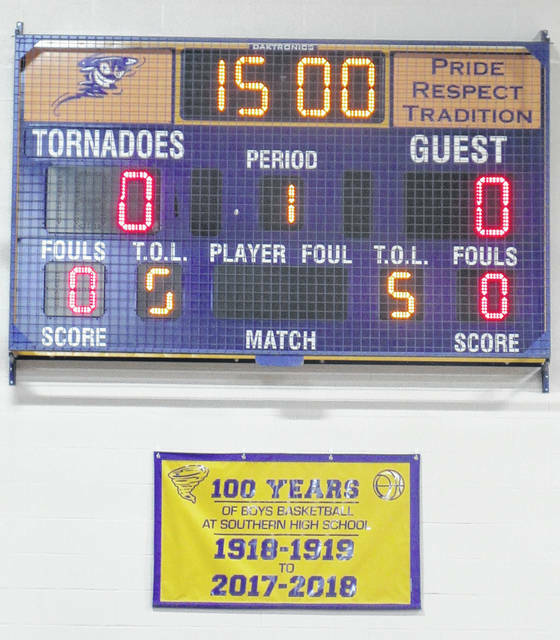 https://www.mydailysentinel.com/wp-content/uploads/sites/14/2017/12/web1_12.12-SHS-220171211183941820.jpgA new 100 years of Southern basketball banner is now located beneath the score board in the Southern High School gymnasium. https://www.mydailysentinel.com/wp-content/uploads/sites/14/2017/12/web1_12.12-SHS20171211183944440.jpgSouthern Athletic Director, former coach and player Carl Wolfe speaks during Friday evening’s 100 years of Racine Southern basketball celebration as members of the administration, along with local and state officials look on.